Successful learning needs a sense of achievement, simple and fun exercises that motivate to learn languages. All of that is easily achieved through music apps and the use of tablets. Our children in refugee homes are always highly motivated by new surprises and the (small) achievements they are able to make. 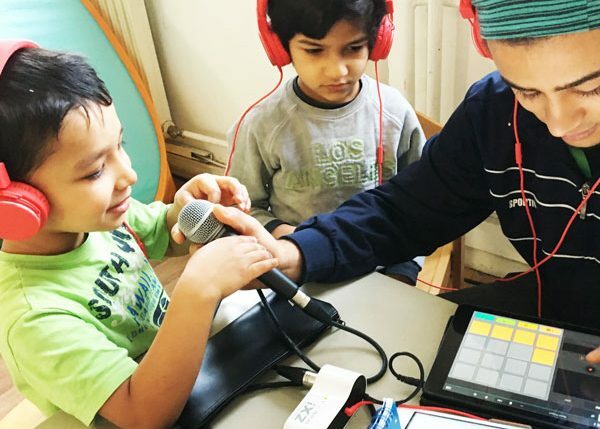 By using music apps they literally learn the new language playfully. We regularly upload audible results on to our SoundCloud account. That session provides an insight to our pedagogical work with music apps. Our successful many years of experience with the Learn-Experience-Programme gained new ideas from the certificate course “tAPP”. Since then a new member from this course has joined the team, Leandro da Silva, a percussionist from Recife in Brazil.